"You know how when your in the desert, sand gets into absolutely everything? It gets under your visor, and in the joints of your armor plating. You know what? That's definitely NOT the worst thing about this desert!" "Sand Worms! That's what I'm talking about. Giant, huge, vicious Sand Worms with teeth as big as an infant Ramorian and breath even worse!" 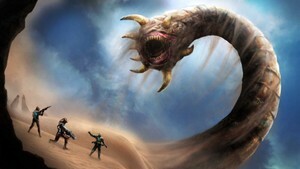 The "Giant Sand Worm" SoundSet gives you everything you'll need for an epic encounter with the worst the desert can offer. There's laser fire, vehicles, bombs, roars, crashes... so much noise, your players will be begging to fight a Giant Sand Worm every game!